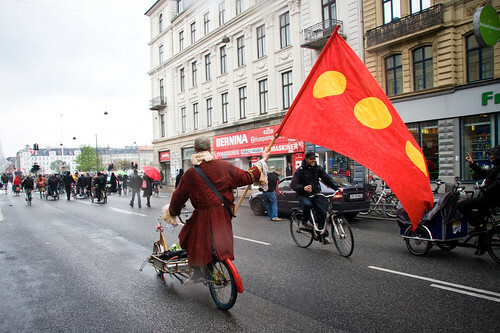 In many parts of the world May 1st is International Worker's Day and Denmark is no exception. 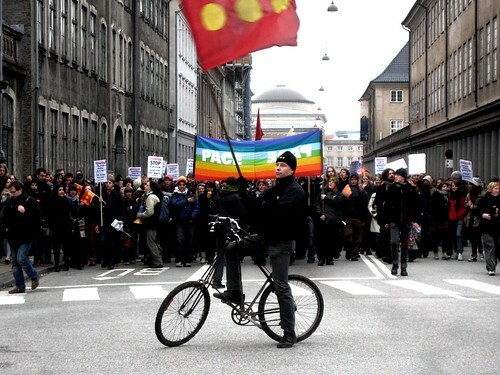 The tradition of marching for workers rights dates back to the 1880's and it's a national holiday in many countries. 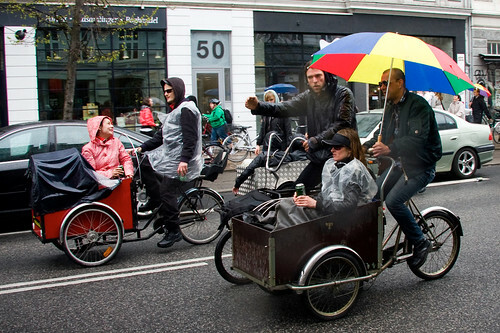 In Denmark you get a half-day off. 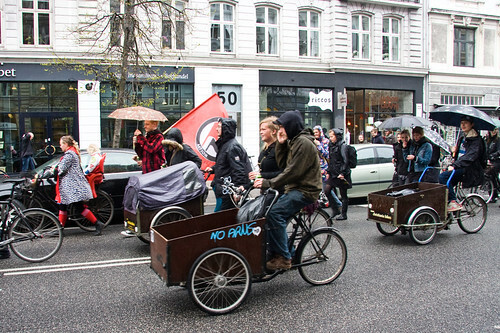 The traditional rally with speeches and music takes place in Fælledparken in Copenhagen but there is also a march through the city and I caught it outside of Larry vs Harry's shop. 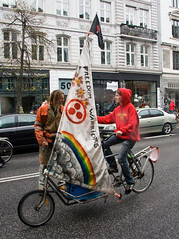 Above is a man on a longjohn carrying the flag of Christiania, the squatters freetown established back in 1972. It's often synonomous with the left of centre movements. 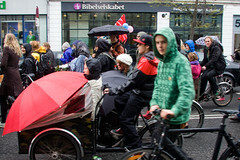 It was a drizzly day but several thousand people hit the streets to celebrate the day. 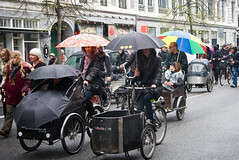 What amazed me was the number of not only bicycles but cargo bikes. 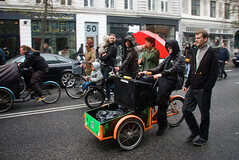 There are an estimated 30,000 cargo bikes in Copenhagen and it seemed that most were in the demonstration. A fantastic display. 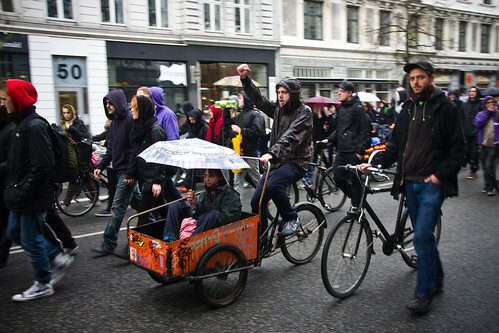 Here's a homemade shopping trolley bicycle. 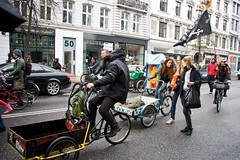 Two example of sailing bicycles sailed past. 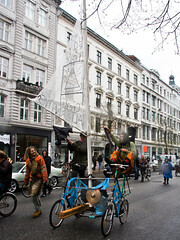 The first a homemade four-wheeler, the second a longjohn with a sail that looked like a jolle. 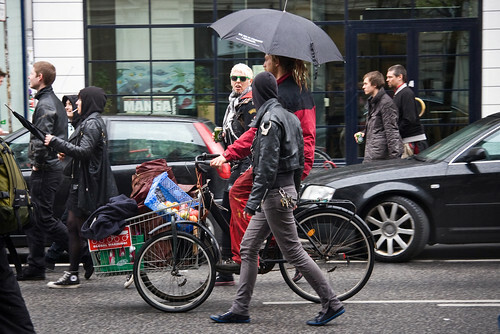 Perhaps even a well-positioned umbrella gives an extra boost. 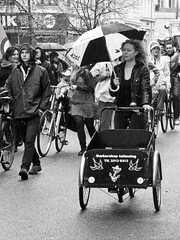 Music is an important part of any demonstration and there were a long line of cargo bikes blasting cool tunes, like these two, above. 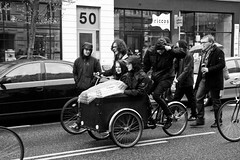 For the most part there were cargo bikes performing their classic workhorse duties, carrying friends and family on the festive route through the city. 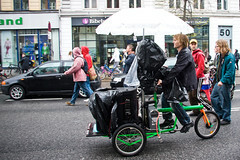 Here's another demonstration a few years ago, with the bicycle firmly in focus.